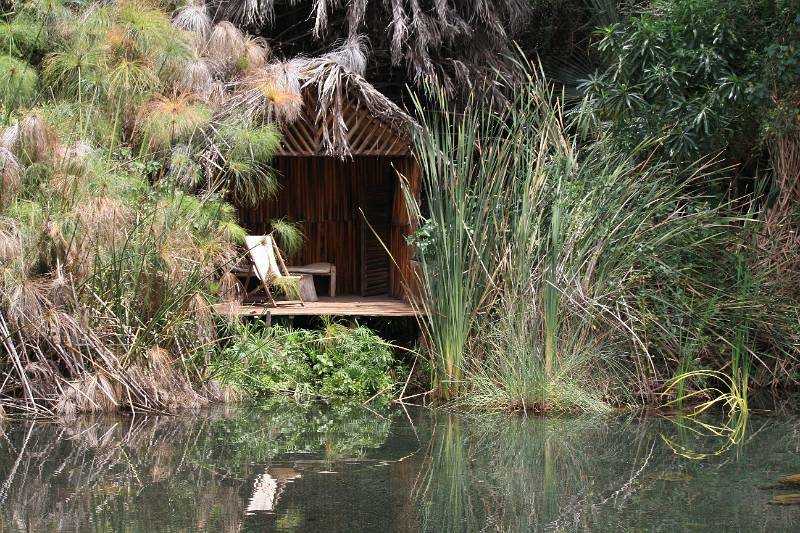 Our Lake Eyasi Safari visited the Datoga on the first day and the Hadza or Hadzabe on the second day. 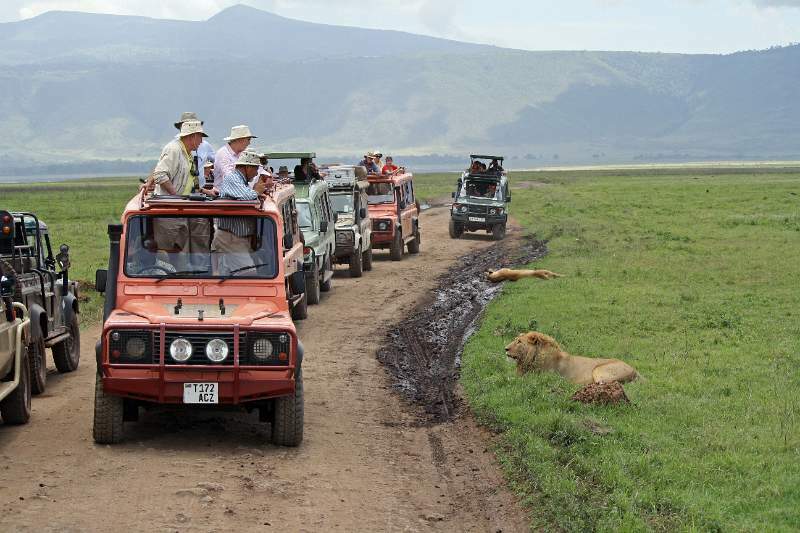 The road in to Lake Eyasi branches off of the main road to the Ngorongoro Conservation Area a few minutes east of the park gate. From there the road quickly deteriorates into one of the worst roads imaginable. 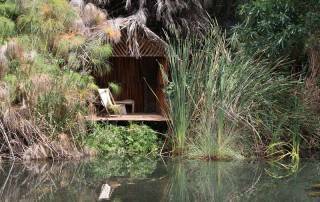 Allow nearly 2 hours to travel the last 25 miles (40 km) to begin a Lake Eyasi Safari. 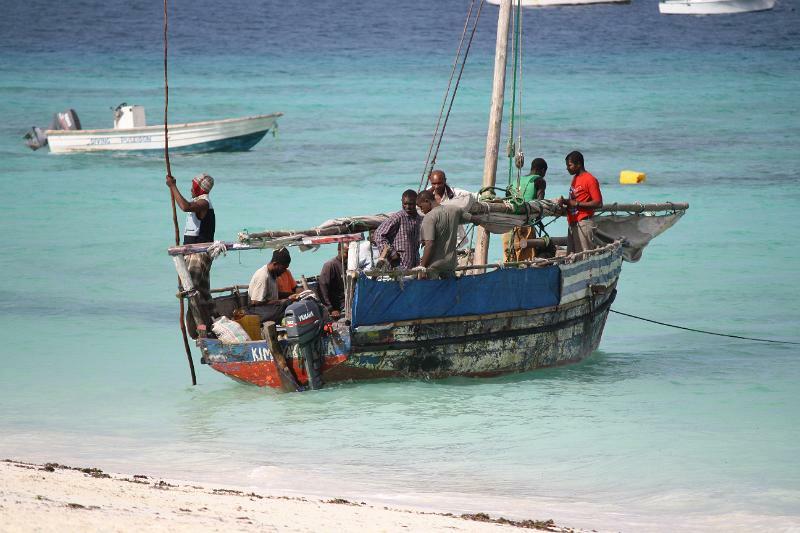 When we reached the southeastern shore of Lake Eyasi, our first stop was at a Datoga village. The village was owned by a man and his 8 wives. 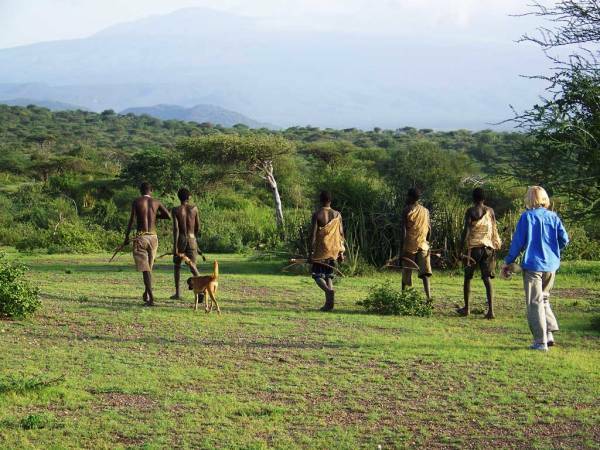 Datoga men build the huts from wood sticks and the women seal them with dung. 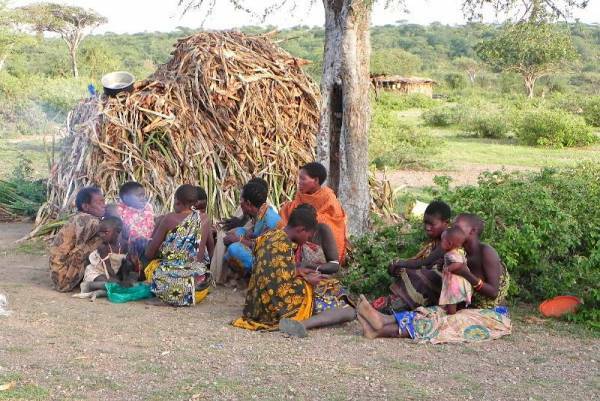 A man obtains wives based on the number of cattle he can offer as a dowry. We entered a small bedroom where one wife and her six children slept. 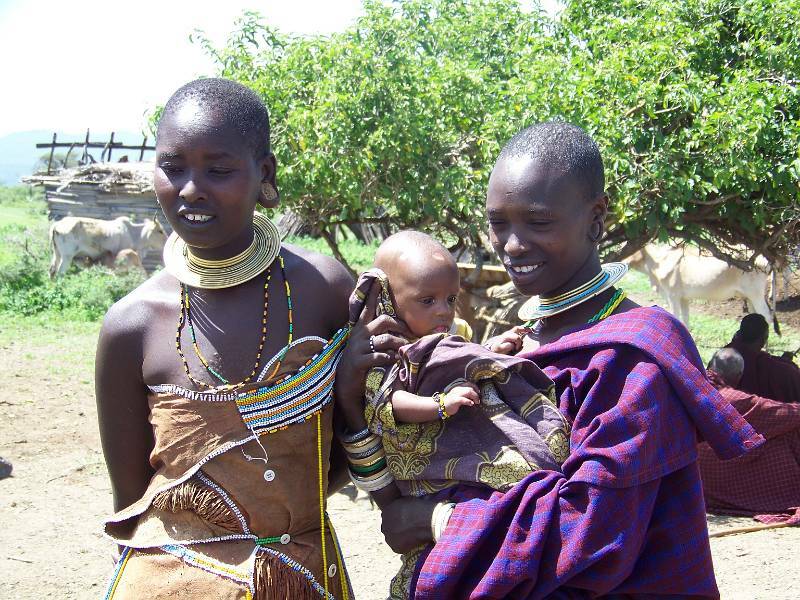 The Datoga have very distinctive dress and traditions that set them clearly apart from the Maasai and the Hadzabe. Their presence puts pressure on the Hadzabe to seek game farther west along the lake, where it’s harder to sustain their live style. Next we visited a local blacksmith shop. An arrow head was fashioned from a melted down padlock. They used homemade bellows and homemade charcoal. The blacksmiths sell the arrowheads to the Hadzabe. 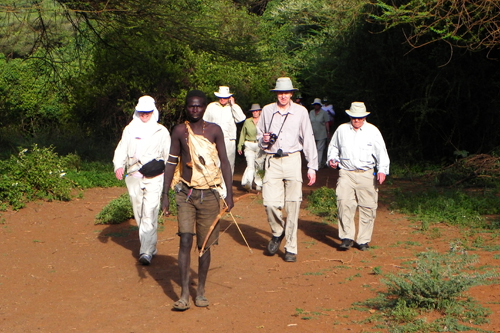 Later in the day our Lake Eyasi Safari visited the Margoala school. The school’s 480 students and their 4 teachers all greeted us and sang the national anthem. Each teacher supervised 3 classrooms of 40 students at the same time. The soccer ball we brought caused great excitement among these extremely well-behaved children. We arrived in the afternoon at Kisima Ngeda Tented Camp, which should be called a Luxury Camp instead. One night at this camp was not nearly long enough for me. 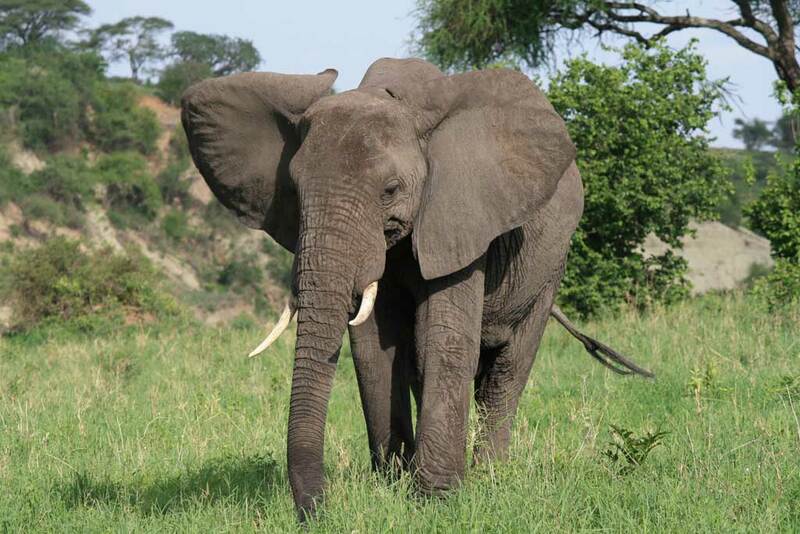 At 4:30 am the next morning, our Lake Eyasi Safari departed Kisima Ngeda to find the Hazabe. The Hadzabe are a group related to the South Kalahari bushmen. There isn’t enough food left for them to survive, so only about 1,500 Hadzabe remained in 2011. They are hunter gatherers. Their food consists of small birds, bush babies and squirrels killed by homemade bows and arrows. Occasionally they kill an antelope or a large kudu and they proudly display the antlers in their makeshift camp. 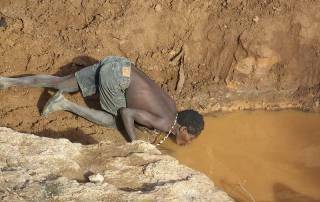 Permanent settlements, agriculture and cattle are forcing the Hadzabe into arid, marginal, areas. 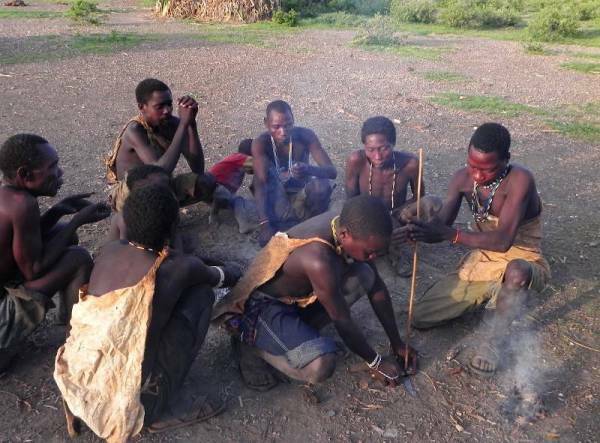 Many Hadzabe are abandoning traditional ways and sending their children to school or making money from safari visits. The Hadzabe we visited were a family group of about 20. 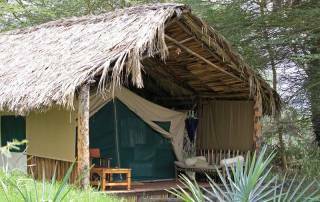 They lived in grass thatch huts about 3 feet high, but in the rainy season they move to caves. There was a lot of evidence of eye problems and medical issues. They usually only live to 45. 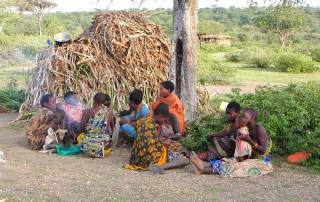 Women and children huddle around the thatch huts in the morning, while men gather around a fire built by rubbing sticks together. They smoke marijuana. There was a lot of choking and coughing. 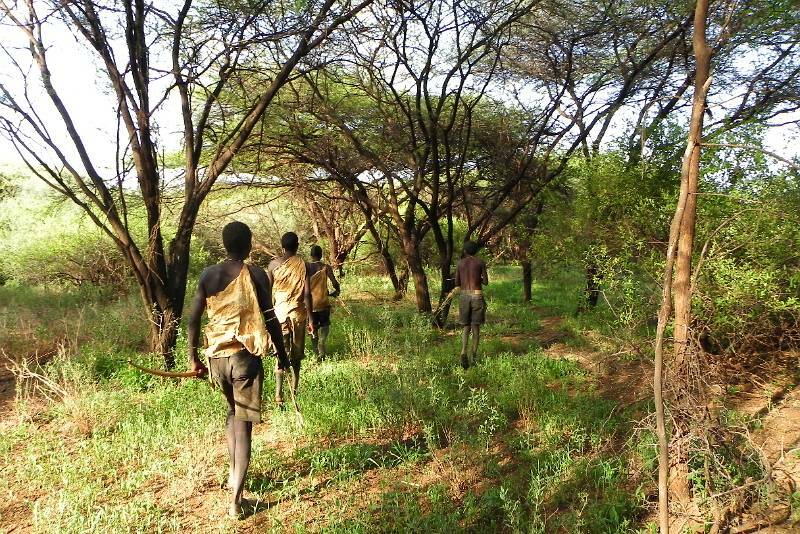 The Hadzabe language uses clicking sounds extensively, making for a very distinctive sound to conversations. Our hunt with the tribe yielded only two small dove chicks. 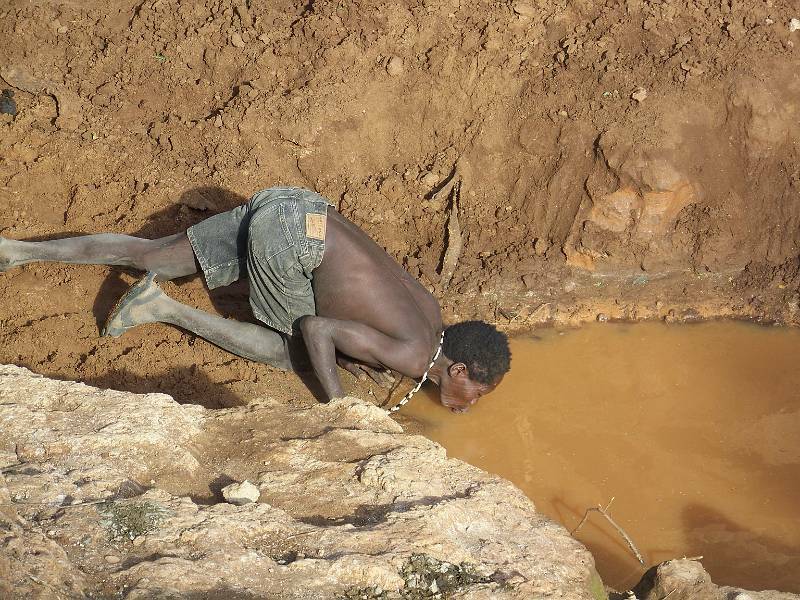 During the hunt they stopped to drink from muddy brown pools of water. Later on they started a fire and threw the two chicks in it. Then they shared the small charred morsels among four of the hunters. The fifth hunter refused to participate, as he felt the size of the kill was too small. He sat well away from the group in protest. 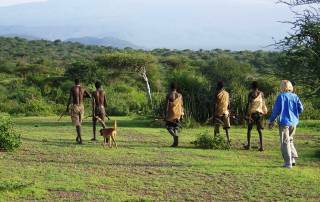 Back at Hadzabe camp we watched an archery display and then they sang a melodic song celebrating the hunt. Next they showed of their homemade beadwork for sale. They were not experienced in selling and didn’t speak English, so it was a bizarre experience. Frantic disputes broke out among tribe members over the cash from the sales.